Indians Baseball Cards: Who ever said cleaning up was bad for you? A few days ago, I received an email from The Fleer Sticker Project, letting me know that he had been cleaning up and found a package on the floor that he thought he had already mailed off to me long ago. He said it would be on its way and when I got home this afternoon (Saturday), the package had arrived! The scan above shows lots of goodies! First, a couple of Topps Coins featuring Ray Fosse and Steve Hargan! And then, a Topps Indians Stamp ALBUM! I have never seen the album before, though I have many of the stamps. And, the album is nearly full of stamps, too! I am going to hunt down the missing ones and stick them in there so the album will be complete. Not for any reason, mind you, just to do it. Also in there, we see Al Smith and Joe Azcue on 1964 Topps! Add to that a whole slew of 1969 Topps cards! Mike Paul, Richie Scheinblum, Max Alvis, Russ Snyder, Vicente Romo, Vern Fuller, Jack Hamilton, and Chuck Hinton cards that are great to look at and wonderful to hold in my hands. But that's not all! The package also included 1970 Tribers Duke Sims and Larry Browne! 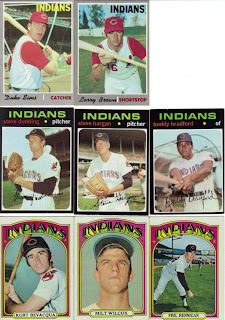 Those were followed up by 1971 Topps Steve Dunning, Steve Hargan and Buddy Bradford. And just when I thought my head would explode, there's Kurt Bevacqua, Milt Wilcox, and Phil Hennigan on 1972 Topps cards to finish things out. 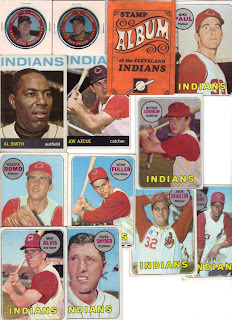 THANK YOU very much to The Fleer Sticker Project for these wonderful vintage Indians cards! I can't wait to find out which ones will fill voids in my collection! Glad to see the cards/coins/stamps arrived safely! Sorry about the long delay, but as they say, good things come to those who wait! I hope a some of those can be used to remove a few cards from your wantlist. Very nice additions ! I have the little stamp album but no stamps.I couldn't find any extra Cliff Lee bobbles last night, just a couple empty boxes. I do have a program for you though.I'll stick it in with your "Free" gift. It should go out tomorrow ! Very very cool. While email is fun and good, there is nothing like the feeling of receiving a package. The cards look sensational. Nice one.